Book Summary: Meet THE BEAR - a cat who carries the weight of the world on his furry shoulders, and whose wise, owl-like eyes seem to ask, Can you tell me why I am a cat, please? Book Review: Do you love the twitter and facebook of MySadCat? Then you will definitely enjoy this book as well. This book is filled with much humor (both from the cats and from Tom's father) over the adventures of raising cats. "Thou shalt have no other gods before thyself"
She hates me loving on any other cat but her and makes it quite known she is the all powering God in my life. That any other worship of any other cat is forbidden and jealousy will rear its ugly head fast. "Thou shalt not covet thy neighbour's cardboard box." This one is a bit on the "if you have a box, then the box is mine. If you are in the box, then you have to get out of the box because it is mine and never ever yours." This applies to the other cats. She hates sharing with anyone and makes it quite clear the boxes are off limits to anyone if she is in them. 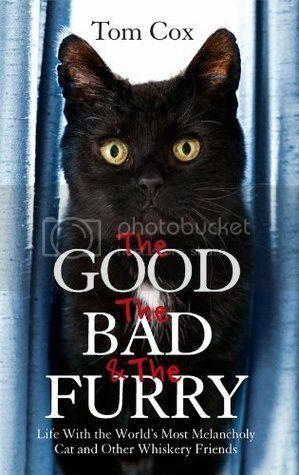 This book is definitely worth a read and one you will find much humor and enjoy the misadventures of raising cats who have quite different personalities. So pick this one up and read!